MTN has hired former US attorney general Eric Holder to help negotiate a settlement of the telco’s $3.9 billion (R62 billion) fine in Nigeria. MTN executive for group corporate affairs, Chris Maroleng, confirmed to ITWeb that Holder is part of a group of legal counsel, including Nigerian lawyers, which MTN has retained in order to try and reach a settlement on the matter. The Financial Times reported Holder had already pleaded with Nigerian officials last month on behalf of MTN. Africa’s largest mobile operator was slapped with a $5.2 billion (R83 billion) penalty by the Nigerian Communications Commission (NCC) in October last year for failing to disconnect 5.1 million unregistered SIM cards on its Nigerian network. In early December, the fine was reduced by 25% to $3.9 billion, but instead of paying the reduced amount, MTN chose to approach the federal high court in Lagos in an attempt to have the fine thrown out. Last month, a Nigerian judge gave MTN and the NCC until 18 March to settle the matter out of court, something Holder will assist with. “I think the magnitude and proportion of the fine implies the operator will have to explore all options in reducing or eliminating the fine,” says Ovum senior analyst, Richard Hurst. He believes that bringing in an experienced negotiator like Holder will likely complement the existing MTN legal team. ICT analyst Adrian Schofield agrees that in the current situation, MTN needs to get the best legal advice it can afford. “If he has a track record of achieving fair settlements in corporate disputes with the authorities, it would be a good recommendation. Bear in mind, he will not work in isolation – he will be supported by a local legal team to help him with Nigerian law and processes,” adds Schofield. 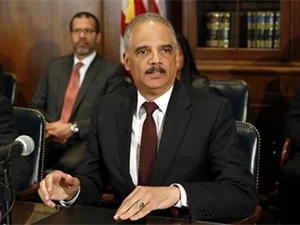 Holder served as US attorney general between 2009 and 2015, and presided over some of the biggest and most high-profile corporate settlements in US history. These included the $18 billion fine issued to BP for the 2010 Deepwater Horizon oil spill, and the $13 billion JPMorgan Chase had to pay for overstating the quality of mortgages it was selling to investors in the run-up to the 2008 financial crisis. Holder was one of US president Barack Obama’s longest-serving cabinet members, and after stepping down as attorney general in April last year, he returned to his previous law firm, Covington & Burling, as a partner. In 2014, Holder was listed as one of Time’s 100 Most Influential People, with the magazine saying he “worked tirelessly to ensure equal justice”. It is anyone’s guess how much MTN will eventually end up paying but Hurst believes both parties need to be flexible and realistic. “The fine needs to be in proportion to the error. Currently, the fine is close to 95% of MTN earnings in Nigeria,” Hurst says. “We have heard the amount is equivalent to three years of profits for MTN Nigeria – the company could survive that but it may slow their investment in infrastructure and will definitely put a squeeze on their cost base and will not endear them to their shareholders,” according to Schofield. Hurst doesn’t think the Nigerian saga has hurt the actual MTN brand as much as it has hurt the perception among investors. MTN’s share price has fallen 31% in the last 12 months but has seen a slight recovery this year. The stock was trading up by around 7% by midmorning at R136.40, putting the telco’s market cap at around R235 billion.